Reaching the breaking point. Life is never simple and rarely easy. All the layers of clothing you choose to wear (i.e., the scrubs over the business suit, under the workout clothes, on top of the jeans, which cover your red superhero’s cape), however, only make it more difficult to get around. Super Woman, Super Man, Super Nurse, Super Parent, or Super Anyone is an illusion that creates stress and dissatisfaction. The quest for perfection and the desire to “have it all” stretch our resources and capabilities to a breaking point. Everyone knows someone who has gone through this. We know a friend who has the perfect house–impeccably decorated and landscaped–the newest cars, the latest designer clothes, and the perfect children–always scrubbed and polished. Then you go to lunch together and your friend bursts into tears about how miserable she thinks her life is. Why all the misery? The misery always is about something that is missing, about a hole so deep and painful that it feels as if it can never be healed–a feeling there is no way out of the perfect mess. There also are some people with lesser heartaches who just never seem to improve. They are always on the run, trying to keep it all going while never enjoying the reasons they are working so hard in the first place. They are just too tired and stressed to enjoy the moment. The burden of technology. Technology has had a tremendous influence on the quality of our lives. The instant access to work, via pagers, cellular telephones, laptop computers, and e-mail makes it harder to find balance between work and personal time. The technology that is supposedly designed to help people work easier and more efficiently has only left some of us working longer and later. Instead of get-ting away from work and having downtime, we are checking e-mail on weekends, having conference telephone calls in our cars, and hauling laptops on vacation. It is no wonder we do not feel renewed, invigorated, and ready to get back to work on Monday morning. We never truly left work in, the first place. After a while, this stress takes its toll. If you do not actively take steps to rejuvenate yourself, your resources can become depleted. You may become so burned out that you no longer seem like yourself or notice the good things in your life that give you energy and fulfillment. There are a host of signs and symptoms that typically are indicative of burnout (Table 1). Depending on the number and severity of your symptoms, you may be slightly toasted-or burnt beyond recognition. Life does not have to be as hard as it seems. If you are thinking to yourself, “Easy for her to say, she does not know my life,” think again. Do you have too many places to go? Been there. Too many bills to pay? Done that. Too many balls to juggle? Dropped them already. 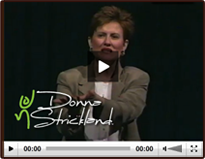 A plethora of speakers, consultants, personal coaches, and management gums all talk about similar issues: Oprah Winfrey talks about how to Make the Connection, Stephen Covey preaches about The Seven Habits of Highly Effective People, and Richard Swenson encourages us to develop more “margin” in our lives.1 This is no accident. The problems of stress, burnout, consumerism, and the loss of focus on personal missions are so rampant that people everywhere are looking for help. You know those people you glimpse sitting at outdoor cafes having lattes at two in the afternoon while you are racing to your next appointment? They have margin in their lives. Those friends who call at the last minute with an invitation to catch a play downtown? Guess what7 They also have margin. Your neighbor who sits on the patio watching the grass grow? He, too, has margin—and so can you. No one who races through life at breakneck speed can feel in balance and content. If police gave speeding tickets for driving our lives too fast, most of us probably would have our “life licenses” revoked. In fact, the majority of us would be sitting on the sidelines waiting for our “life licenses” to be reinstated, while the rest of the world was run by teenagers, 20-somethings, and retired people. One thing is for sure: The workday would be a lot shorter. Fundamental to achieving balance is slowing to a pace that provides some margin. You cannot be in overdrive all the time without causing irreversible damage to your engine. In this case, the engine is the heart, soul, and spirit that animates your living. Slowing down takes some practice, especially if you have not stepped on the brake pedal in a long time. The reason slowing down can be difficult is that it requires putting the word “no” back into your vocabulary. Contrary to popular belief, you did not use up your quota of no’s when you were a toddler, and not even when you were a teenager. You still have a bunch of no’s inside of you, ready to be set free. One reason we have lost touch with the word no is that we conjure up all kinds of negative con-notations with the word that we, in turn, ascribe to ourselves. For example, if I say the “n” word, I feel I may be perceived as being selfish, irresponsible, lazy, and in danger of losing my red Super Woman cape. Saying no, however, is a way of setting limits and having boundaries. It allows us to define our lives according to our own desires, standards, and principles. It aligns our actions more closely with our hearts, and it means we are making conscious choices about our lives and how we spend our time. A good place to start practicing this an is by saying no to tasks and obligations that we do not particularly enjoy doing. For instance, if you detest cooking, choose one night a week to eat out, carry in, or give the responsibility to another family member. Another good place to draw the line is in taking on new responsibilities. Make a point to not add more to your “to do” list. Although it may be flattering to be nominated to chair a committee, organize a blood drive, or choose a bosses’ day gift on behalf of your department, you do not need to do these tasks just because you have been drafted. There always is a tendency to draft people who are known to never say no. It can be difficult to release that “no” from the back of your throat when you receive an invitation to do something you love. It can be tough to turn down the good things (e.g., tickets to see your favorite team, an invitation to stay at a friend’s condominium at the beach for a weekend getaway, a party with incredible networking opportunities). If the offer sounds great –but saying yes creates a burden–you may need to say no to maintain balance in your life. I know a pair of twin girls who turned four years old one month before Halloween. They were so excited to go trick-or-treating after dinner that they even drew a map of the neighborhood to plan their route. They had gone to roughly six houses when Maddie turned to her mother and said, “All this work is making me weak. Can we go home?” Maddie was clear: Trick-or-treating was great, but she was tired and ready to go home. So, home she went. Her sister, Claire, stayed out and visited another 11 houses before deciding that she had had enough. The point is that Maddie recognized her limit, stated her need, and got it met immediately. If a four-year-old can do it, so can the rest of us. Setting limits and establishing boundaries takes practice. It also takes some self- examination. What are the reasons you struggle with saying no? Why is it so hard to politely decline? We all have reasons for shying away from taking care of ourselves. For some, it is guilt; for others, it is a fear of consequences or a desire to avoid potential conflict. In any case, it is important to reflect on–and then tackle–the hurdles that keep us from setting limits and freeing ourselves. Blaming. You tell yourself that someone is keeping you from obtaining your goals. When you blame others, by saying for example, “He never gives me a chance to speak,” or “I would change jobs but my wife would never go for it,” you abdicate your personal power to someone else. Fear of rejection. You tell yourself that if you really speak the truth, you will not be loved or accepted. For example, you might say, “She will laugh at me,” or “He will be disgusted and leave.” If you allow this fear to rule your life, you will feel resentful over the control you have given others. It is not nice. You tell yourself you cannot be considerate of someone else’s needs and your own at the same time. You might say, “I cannot say what I feel, she will be crushed if I tell her that,” or “He has had a rough time recently, he is in worse shape than I am.” You can be considerate and take care of your needs at the same time–it is called being assertive. Assertiveness is all about standing up for yourself in a respectful manner. It is too much trouble. You decide that it is just easier to do something yourself. For example, you might say, “I will just have to do it over because she will not do it right,” or “It is not worth the fight; it will rain the whole weekend if I open this can of worms.” Thinking or saying these types of things ultimately results in pent-up resentment and the martyr complex. Taking responsibility for others’ feelings. You decide in advance how the other person will respond and alter your course of action because of the anticipated response. As an example, you might say, “She will be furious,” or “He may start drinking again if he hears about this, and I cannot risk that.” This is a way to avoid conflict as well as honest communication. It takes courage and honesty to look at the obstacles that keep us from realizing our dreams. You may find that you need some assistance to remove the barriers that keep you entrenched in an unsatisfying role. Whether it is writing in a journal, finding a coach or therapist, reading a self-help book, or joining a support group, seek help out. Get the resources and support you need to be successful in carving out contentment. Is that you perched high in the control tower, scanning the distance for incoming activity? Is that you keeping an eye on the scheduling board every minute, assessing the efficiency of the current plan? Are you the one solving your colleagues’ personal problems and chairing every committee that involves your department? Do you stop as you over-hear conversations and offer advice on the issue–even without having heard the whole situation? Signs of having control issues. If any of these examples resonated with you, you may be spending too much energy trying to control the universe. Working that hard trying to run everything perfectly–because no one can do it as well as you–is another energy draining, distracting, and sabotaging activity that hinders your balance. believing that no one else can do it as well or as efficiently as you can. You do not have to do it all. Of course, it can be gratifying to be the “King or Queen of Every-thing.” It can fill you with a sense of importance and purpose that you may have trouble finding in other ways. I used to do just that: I would immerse myself in planning, organizing, and overseeing everything because I thought that no one else could do it as well as I could. It took me years to figure that–even if I could do it better than anyone else–it did not matter. There are multiple roads to the same destination. One road is not necessarily better, although the roads are different. Those differences threatened my self-esteem because I derived my self-concept from what others thought of me. I did not believe that I innately was a good and worthy person. Like many people, I measured my self-worth by my accomplishments. Doing more and doing it better–as evidenced by the praise I received from coworkers and supervisors–was how I defined myself. It was a long, painful, and essential journey to embrace the idea that each of us is good, loving, and deserving just by being human. Over time, I began to climb down from the control tower and let someone else be in charge. At first I only surrendered control of small details for brief periods of time. Gradually, I loosened my hold and let others take responsibility for their own parts. It was scary, and once in awhile I would run back to the control tower and commandeer things. I, however, have since relinquished more control, and it has been a relief. I now have time and energy to pursue my own passions instead of managing everyone else’s. By setting limits, turning down requests and opportunities, and getting comfortable with the “n” word, doors will open to new possibilities that are founded on your conscious choices. Swenson offers some guidance on what else we can do to create room in our lives. Most of his tips sound simple, but it takes discipline to establish new patterns. The tips include the following. Consciously slow down the pace of your life. Carve out a time to languidly relax, take a long hot bath, read the newspaper cover to cover, take a nap, or listen to favorite music. Eat a balanced diet. Give your body every advantage by feeding it well. Exercise regularly. Give up those excuses. Cultivate contentment. Do not seek to constantly acquire more, better, and new stuff. The more you can live without, the more free you are. Avoid debt. It is oppressive and burdensome and can keep you from making healthy choices. Choose function over fashion. Do not go for status; go for what will get the job done. Examine the necessity of time-saving technologies. Do you really need the cellular telephone, pager, answering machine, home fax machine, and e-mail? Or are they impeding your ability to get work done because of all the interruptions? Do less, but do the right things. Set priorities and live with intention according to your values. Do yourself a favor and give yourself as much tender loving care as you give the rest of the world. Once you say no, do not give a litany of excuses. People will try to find fault with your excuses and try to change your mind. Toss junk mail in the flash unopened, if you did not solicit it, you do not need it. Avoid getting bogged down perusing every catalog that gets delivered. In fact, get your name removed from mailing lists by requesting a form from Mail Preference Service, c/o Direct Marketing Association, PO Box 9008, Farmingdale, NY 11735-9008. Choose your friends carefully. Life is too short for fake smiles and false friends. Surround yourself with a smaller circle of flue-blue friends who will be honest, supportive, and compassionate. Let go and laugh. Cry, too. It changes your neurochemistry by decreasing cortisol levels that cause depression. Make time for meals. Eating on the go or finishing your meal in your office only adds to mental fatigue and gastrointestinal upset. Take a break and have lunch outside with friends. Be merciful with yourself. Research shows that those who take their errors in stride have higher self- esteem and experience less stress. Create your own rituals. Try writing in a journal, curling up with a pet after a long day, lighting a candle at mealtimes, or drinking a cup of coffee and reading the paper every Sunday. Rituals provide symmetry and comfort. No matter what else is going on in your life, you can count on your rituals to be grounding. Avoid perfection. It does not matter if your house cannot pass the ‘white glove test’ and you cannot arrange flowers like Martha Stewart. There is enough other stuff to worry about. Learn to let go so you can grow. Turn your catastrophes into ‘course corrections? Get over yourself. If you regularly are getting in your own way, gel help. Find the courage to ask for help. These are difficult times in health care; dig down deep for your faith. Nurses do a great job of taking care of everyone—except themselves. Do yourself a favor and give yourself as much tender loving care as you give the rest of the world (Table 2). Our most precious commodities are not our material possessions but our time and the people who populate our lives. Recently, a close friend of mine lost her 16-year-old nephew due to complications of cancer. The funeral was not a traditional service, but rather it was called, “A Celebration of Peter’s Life.” It was the most powerful and moving event I have ever attended. Approximately 15 people all spoke about Peter and what he meant to them. Kids, teachers, aunts, uncles, and his sister each told stories of Peter’s amazing courage, compassion, and sense of humor. A high school auditorium overflowed with people showing their gratitude to a young man who understood that every day, every hour, every minute, and every second on this planet is a gift to be appreciated and used wisely. At the end of the day, what matters is how we lived our lives, and not what trinkets decorate our mantles. Each of us has a responsibility to live with integrity and to slow down enough to see our children, our gardens, and our dreams. Living with intention and making conscious choices allow us all to walk a path of contentment and have a life rich of meaning and purpose. So, get out there and find an opportunity to say no to outside pressures, and, instead, say yes to yourself. Then, get yourself all dressed up– in one layer of clothing only–and get to that single destination you desire. You will be a beautiful sight. 1. O Winfrey, B Greene, Make the Connection (New York: Hyperion, 1996); S Covey, The Seven Habits of Highly Effective People (New York: Simon & Schuster, 1989); R Swenson, “Breaking life’s speed limits,” Healthwise (Fall/Winter 1996) 4-6. 2. Swenson, “Breaking life’s speed limits,” 4-6.